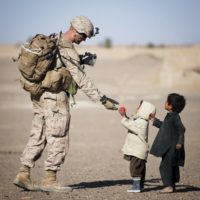 Military Deployment and Time-sharing – Daniel M. Copeland, Attorney at Law, P.A. Active duty service members are protected under the Servicemembers Civil Relief Act (SCRA) but they are also protected under §61.13002 of the Florida Statutes, if a motion for modification of time-sharing or parental responsibility is filed because a parent is activated, deployed, or temporarily assigned for military service and the parent’s ability to comply with the standing time-sharing agreement is materially affected, the court cannot issue an order to modify or amend a previous judgment that changes the time-sharing arrangement as it existed on the date the parent was activated, deployed or temporarily assigned for military service. Under §61.13002 (2), if a parent is activated or deployed for military service on orders in excess of 90 days and the parent cannot comply with the time-sharing agreement, then he or she may designate a person or persons to exercise time-sharing with the child on the parent’s behalf. However, this designation shall be limited to a family member, a stepparent, or a relative of the child by marriage. For a more detailed discussion of a military divorce, click here.